Let’s look at sides and angles of similar polygons. Choose whether each of the statements is true in all cases, in some cases, or in no cases. If two figures are congruent, then they are similar. If two figures are similar, then they are congruent. If an angle is dilated with the center of dilation at its vertex, the angle measure may change. Let’s look at a square and a rhombus. Priya says, “These polygons are similar because their side lengths are all the same.” Clare says, “These polygons are not similar because the angles are different.” Do you agree with either Priya or Clare? Explain your reasoning. Now, let’s look at rectangles $ABCD$ and $EFGH$. Jada says, “These rectangles are similar because all of the side lengths differ by 2.” Lin says, “These rectangles are similar. I can dilate $AD$ and $BC$ using a scale factor of 2 and $AB$ and $CD$ using a scale factor of 1.5 to make the rectangles congruent. Then I can use a translation to line up the rectangles.” Do you agree with either Jada or Lin? Explain your reasoning. Points $A$ through $H$ are translated to the right to create points $A’$ through $H’$. All of the following are rectangles: $GHBA$, $FCED$, $KH’C’J$, and $LJE’A’$. Which is greater, the area of blue rectangle $DFCE$ or the total area of yellow rectangles $KH’C’J$ and $LJE’A’$? Your teacher will give you a card. Find someone else in the room who has a card with a polygon that is similar but not congruent to yours. When you have found your partner, work with them to explain how you know that the two polygons are similar. On the left is an equilateral triangle where dashed lines have been added, showing how you can partition an equilateral triangle into smaller similar triangles. Find a way to do this for the figure on the right, partitioning it into smaller figures which are each similar to that original shape. What’s the fewest number of pieces you can use? The most? Every angle and side in one polygon has a corresponding part in the other polygon. All pairs of corresponding angles have the same measure. 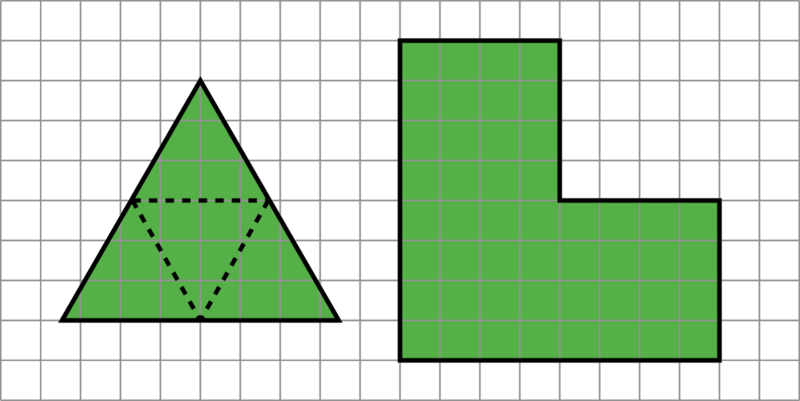 Corresponding sides are related by a single scale factor. Each side length in one figure is multiplied by the scale factor to get the corresponding side length in the other figure. 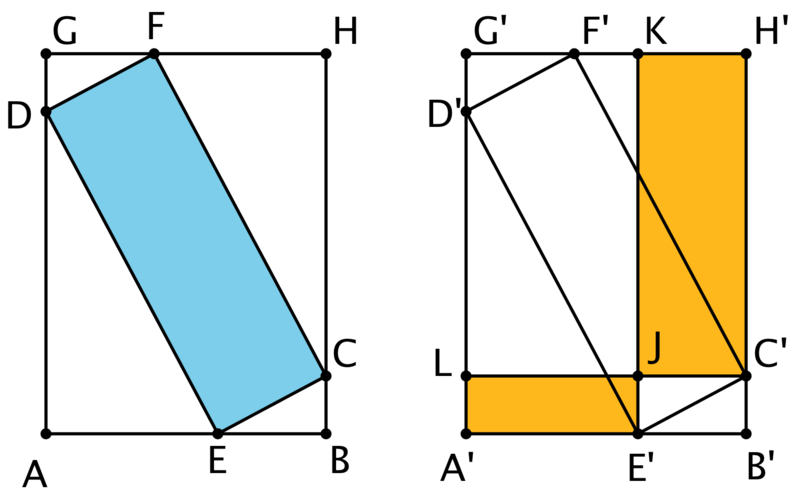 Consider the two rectangles shown here. Are they similar? It looks like rectangles $ABCD$ and $EFGH$ could be similar, if you match the long edges and match the short edges. All the corresponding angles are congruent because they are all right angles. Calculating the scale factor between the sides is where we see that “looks like” isn’t enough to make them similar. To scale the long side $AB$ to the long side $EF$, the scale factor must be $\frac34$, because $4 \boldcdot \frac34=3$. But the scale factor to match $AD$ to $EH$ has to be $\frac23$, because $3\boldcdot \frac23=2$. So, the rectangles are not similar because the scale factors for all the parts must be the same.